Detailed coverage is also given to structural and elastic properties, trace of large deformation, buckling and post-buckling behaviors, fracture, vibration characteristics, wave propagation, and the most promising engineering applications. 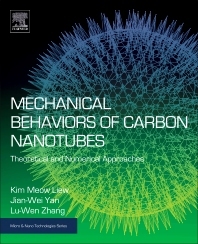 This book not only illustrates the theoretical and numerical methods for analyzing the mechanical behavior of carbon nanotubes, but also contains computational results from experiments that have already taken place. Kim Meow Liew is the Head and Chair Professor of Civil Engineering at City University of Hong Kong, Hong Kong. His research activities encompass computational mechanics, optimization, numerical methods, nanomechanics and nanomaterials, multi-scale modeling, simulation and bioengineering. He is the Editor-in-Chief of International Review of Civil Engineering (Praiseworthy Prize) and Journal of Modeling in Mechanics & Materials (De Gruyter) and Associate Editor of Journal of Vibration and Control (Sage) and Journal of Nanoscience Letters (Simplex Academic Publishers). He serves on the editorial boards for more than two dozen journals. He has contributed over 750 articles to peer-reviewed journals, and is a Fellow of the HKIE (Hong Kong), ASME (USA), IMechE (UK) and IES (Singapore). He is listed by the Institute for Scientific Information (ISI) as a Highly Cited Researcher in engineering. Jian-Wei Yan is a Lecturer in Solid Mechanics at the Key Laboratory of Product Packaging and Logistics of Guangdong Higher Education Institutes, Jinan University, China. His research focuses on the mechanical behaviors of nanostructures, and on computation mechanics, and he has published 11 papers in peer-reviewed journals. Lecturer in Solid Mechanics at the Key Laboratory of Product Packaging and Logistics of Guangdong Higher Education Institutes, Jinan University, China. Lu-Wen Zhang is a Distinguished Research Professor in Mechanics at Shanghai Jiao Tong University. Previously she was an Associate Professor at Shanghai Ocean University, China. Her main research interests focus on the computational mechanics, nanocomposite materials and smart structures. She works on her research in the areas of theoretical development and application of numerical and computational methods for applied mathematics and nanomechanics. She has published over 65 peer-reviewed journal articles, and is Editor of Journal of Modeling in Mechanics & Materials (De Gruyter). She was also Guest Editor on a Special Issue of Mathematical Problems in Engineering Journal (Hindawi Publishing) on Computational Methods for Engineering Science in 2014.